There are no flowery fields of clover in Brooklyn. So on hot summer nights, streets and sidewalks become living rooms and tiny backyards become campgrounds. The nonnas’ grandsons gather their supplies for their campfire feast: a rickety four-legged metal burner that should hold a can of Sterno, twigs and newspapers to place on the burner, a can opener, and a bottle opener. Their feast of choice: new potatoes that a nonna has scrubbed pristine, as many cans of Heinz Pork and Beans as there are guests, and bottles of Mission soda –grape, cream, lemon-lime. The boys set up camp as far away as they can from both the circle of folding chairs the nonnas occupy and the fig tree. About the fig tree? A nonna has warned them within an inch of their lives to keep their distance. The nonnas shoo away the campgoers’ younger siblings, especially sisters, as soon as they step foot in the yard. The boys each throw a flaming Diamond wooden match to ignite the crumpled newspapers the twigs rest on. Their mothers lean out of second-and-third-story windows or sit on fire escapes watching the dinner party. Even though they find the boys and their fire-making activity nerve wracking and it gives them occasion to bite their fingers in frustration, they respond to the nonnas’ leave-them-alone hand motions and suffer in silence. In the nonnas’ circle it’s outdoor crochet season — and their fingertips dance nimbly to create edges of lace on white linen handkerchiefs. The embers are glowing brightly as the boys toss the potatoes into the makeshift oven. The crisp click of a can opener piercing a can is followed by the release of the sticky sweet scent of pork and beans. Each boy places his newly opened main course alongside the fire. “Bah, the spoons, the spoons.” a nonna says. ” They forgot the spoons.” She rises and and goes into the building. In the meantime, the other nonnas call upon all the saints in heaven to protect the boys from setting their hair on fire. The boys have commandeered an old tin tray from a local bar to use as a serving dish for the poatoes. Chipped white soup bowls on loan from a nonna’s kitchen fill in for sharing. Anticipation fills the air as the boys use tongs to push and pull spuds out of the fire and pour the barely lukewarm beans into the bowls. The nonna who retrieved the spoons passes them out. The boys are about to dig in. But the oldest in the group signals to the others to gather around. Each boy begins to spoon a portion of beans and broken bits of potato into a bowl. They throw out their fingers in “once, twice, three, SHOOT!” to appoint a bowl carrier. The chore or the honor falls to one of the youngest. The dish-bearer starts runing to his buddies — all the while, shaking his head and waving his arms in disbelief. Rinse beans; soak in a nonreactive casserole overnight. 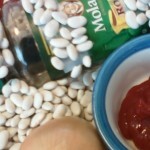 Drain soaked beans; add cold water to cover beans by 3 inches. Add bay leaf , dash of salt and pepper; bring to boil. Reduce heat; cover casserole; simmer beans 1 1/2 to 2 hours, or until tender. Preheat oven to 250 degreesF. Remove rind from bacon; dice into 3/4-inch cubes. Blanch bacon in boiling water 10 minutes; drain. To the casserole, add a layer of beans, a layer of onions, and a layer of bacon. Repeat layering, ending with a layer of bacon on top. Mix remaining ingredients together; pour over beans in casserole. Add enough boiling water to cover the beans by 1 inch. Check throughout cooking time; add more boiling water if necessary. Bake 5 to 6 hours, or until beans have absorbed most of the liquid. Uncover casserole for last half hour of baking. Oh come on…is this oure fiction? Did you REALLY see this baked beans scene? Where are the girls while this goes on? Do THEY get any? Do you think this is part of “americanizing” the kids? I can’t believe that was important to the nonna…or was it? Yes. The baked beans scene went on in most backyards. Often the nonnas supervised–sometimes the mothers did. The girls were not included. In those days, it wasn’t a “girl thing” to do. Boys didn’t roast potatoes in your neighborhood? What a waste. Just the smell was enough to send you over the moon.